Psychrometry involves the study of moisture content in the air. In atmospheric conditions, water vapor content in air typically varies between 0% and 3% by mass. Humans require air with a specific amount of moisture in order to remain healthy, safe, and comfortable indoors, which is where proper humidity control comes into play as a contributing factor. When the need arises to address air moisture, a psychrometric chart can be created to present a visual representation of factors contributing toward water moisture in the air of an environment. This guide will examine the variables in question that are typically included. Also known as the humidity ratio and illustrated as the vertical axis of a psychrometric chart, moisture content represents the mass of water vapor per unit mass of dry air. It is normally designated as “W” on the chart. Total heat – otherwise known as enthalpy - represents the amount of heat energy in the air. This means that all heat, including that which has been generated by dry air and water vapor, is included. Enthalpy can be found on a psychrometric chart in the form of diagonal lines, in most cases. Measurements are made in BTU per pound of dry air in the U.S, while elsewhere in the world it is measured in Joules per kilogram. Dry bulb temperature refers to the use of a traditional thermometer, as its bulb possesses no moisture. This involves the analysis of ambient air temperature. 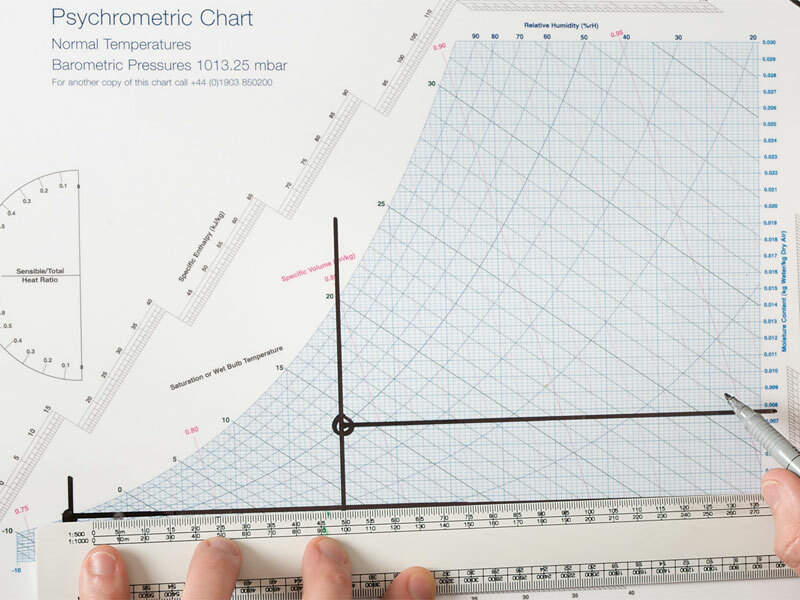 The Dry bulb temperature refers to the ambient air temperature, which remains unaffected by air moisture, and this variable is shown as the horizontal axis of a psychrometric chart. Wet bulb temperature has essentially the reverse effect of this process, involving covering the bulb of the thermometer with a wet cloth before taking a temperature reading. Depending on the amount of humidity present, the evaporation rate on the wet bulb and temperature differences between the two forms of bulb readings will vary. When the moisture on the wet bulb evaporates, it lowers the temperature, and when there is less moisture in the air altogether, this process will be faster and result in an even colder reading. When consulting a psychrometric chart for evaporative cooling purposes, wet bulb temperature plays an integral role in regard to performance, helping to determine the minimum operating temperature required. Shown as horizontal lines on a psychrometric chart, the dew point is literally what it sounds like – the precise point at which water vapor starts to condense out of the air, completely saturating the air temperature in an environment. The dew point temperature of an environment typically matches 100% relative humidity, and it will remain mostly unchanged if dry air is cooled without adding or removing water vapor (dry and wet bulb temperatures will fall as a result, however). 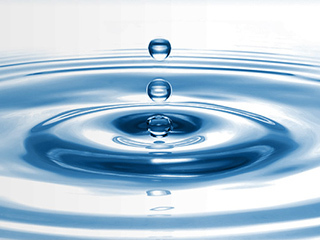 If water is directly introduced into the air to evaporate, the dew point will rise while the dry and wet bulb temperatures would respectively fall and stay the same. Representing the amount of water vapor in the air as a percentage, relative humidity readings are an indicator of how suitable an environment is for specific applications, each of which requires specific RH percentages for a healthy, safe, and comfortable space. In general terms, 40% to 60% RH is considered the most ideal for human habitation and/or interaction in environments such as hospitals, offices, schools, retail, and industrial applications as it reduces the risk of electrostatic discharge (ESD), minimizes airborne infection potentialities, and increases comfort. It also helps to protect sensitive materials, coatings, and processes such as printing. The key RH strikes an atmospheric balance that allows air not to be overly dry or moist. The opposite of density, specific volume is represented as diagonal lines on a psychrometric chart as the volume per unit mass of air. It is measured by cubic feet per pound of dry air in the U.S; anywhere else in the world it is measured by cubic meters per kilogram of dry air. Combined, these properties make up the data visually represented on a psychrometric chart. Condair’s team of engineers and humidification experts utilize this information to ensure that all humidifiers we have available to customers are of the most efficient, reliable, and effective quality. With such valuable data available at our (and your) fingertips, it’s never been easier or more convenient to obtain proper humidity control for your needs. Reach out to us today to learn more about how Condair’s humidifiers can keep you healthier, safer, and more comfortable, or consult our Psychrometric Calculator to analyze your environment today. You can also view our newly published Best Humidifier Guide to learn which Condair humidifier best suits your needs. Speak to one of our humidification experts today to learn more about humidification for your application.